You will earn 20,893 Reward Points. Earn 1 reward point for every 1 dollar spent. Wells Universal hoods are Certifi ed Type-1 compliant, UL710B approved recirculation hood systems and feature completely self-contained air filtration and fire-suppression systems. They do not require venting outside making it possible to cook in nontraditional locations or when traditional Type-1 hoods and ductwork are impractical, restricted or too expensive. 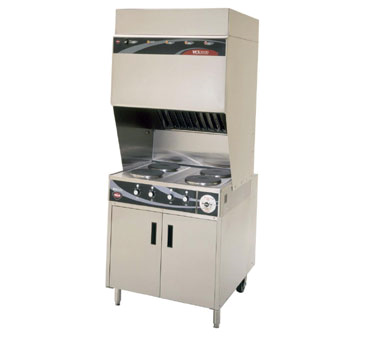 VCS models are integrated with hood and cooking equipment in one, ready to use package. Exhaust and Air Flow – Exhaust air is vertical discharge. Typical airflow is 800 CFM. A minimum of 400 cubic feet of fresh air per minute is recommended both in and out of the cooking area to ensure the dilution of cooking aromas. Fire Protection – Completely self-contained ANSUL® R-102 system includes ANSUL® tank, nitrogen cartridge, ANSUL® sopanifier, piping, fusible links, ANSUL® drops, nozzles, and movable manual pull station. Manual pull can be relocated to the egress position or an additional station can be added by an authorized ANSUL® representative. Fire protection system meets NFPA 96 Chapter 13. Fire protection system must be charged and certified by ANSUL® Authorized distributor after installation and before first use (operator’s responsibility). Filtration – Completely self-contained filtration process reduces emissions below that allowed in NFPA 96 and ANSI UL710B using the EPA 202 test method. VCS includes a fully self-contained 4-stage air filtration system including a stainless steel grease baffle filter with grease cup, a fi re-rated fiberglass pre-filter, a HEPA (High-Efficiency Particulate Air) filter / carbon-charcoal filter pack. All filters are easily removable without tools. Air flow sensors continually monitor air flow optimizing performance and grease removal while an interlock system will not allow cooking appliances to function if filters are missing, clogged or in the event of a fire. Cooking Appliances – Cooking equipment is included and integrated in all VCS models. Both the WV4HF and WV4HS includes a sturdy and practical stainless steel cabinet base for storage, featuring dual-hinged stainless steel doors and heavy-duty hinges for durability and ease of access. The WV4HF also includes four French style hot plates while the WV4HS includes four spiral style hot plates. Hot plates are independently regulated by infinite controls with positive-off positions.